The easiest way to fight this boss is to knock over a goblet (run with tower shield up, for example). The Guardian will try to reignite the goblet, which leaves him open to attacks. 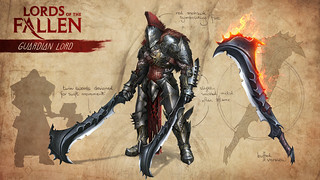 Killing him this way, however, will NOT get you the legendary version of his Firewalker sword. If you want the legendary version, you have to kill him without knocking over the goblets. The best opening to attack him is while he's kneeling on the floor with both swords up in the air. At that moment he is summoning fireballs from the goblets. But right before they will shoot at you, the Guardian will knock you down which in turn will make the fireballs miss you. If you're struggling with this fight, use the best armor with the highest poise you have and equip them with physical resistance and fire resistance runes.